I took an English teaching job over here in NW Oman and bought this 1997 Wrangler about a month ago in Muscat. It's in the shop right now because the transfer case is out and it's hard to get NP 231 parts over here. The four wheeling here is really good and there's a lot to see so I'm just waiting to get the call that the rig is fixed. I love my Jeep even though parts are very hard to get here! 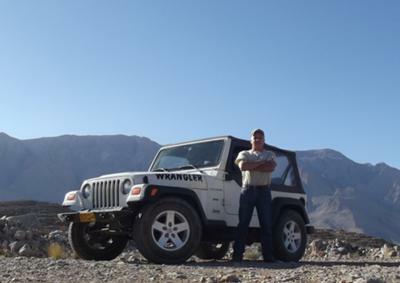 Larry's Comment: Nice looking '97 Wrangler TJ, Ernie. Jeep parts may be hard to find in and around Oman, but I would think that petroleum (gas and oil) would be plentiful being right on the Gulf of Oman and the Persian Gulf shipping lanes. Thanks for submitting your Jeep...and be safe.